This weeks showcase home is 251 Summit Avenue. Known as the Horace Rugg residence, this was built in 1887 by Allen Stem for a cost of $24,500. Originally built as a single family residence, the home has seen many owners. In the 70’s the home was occupied by the Catholic Education Center, with the late 1990’s seeing the home converted to three condominium units. The estimated value of the building/units is well over $1 Million. The home is an excellent example of Richardson Romanesque style, dominated by the masonry walls built of rough-faced, squared stonework, arched doorways and windows, and a tower. Most homes built in this style feature the red tinted stone show here and have decorative panels. 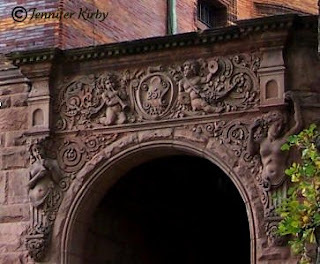 This home has beautiful carved panels in the entrance arch of classic nudes and scroll work. The tower is on the side and is built into the home. If you get a chance to walk by this home, you will see it is grand feat of architectural design. I have not seen the inside, but it is said to have a variety of different wood species, including cherry, oak, and sycamore.